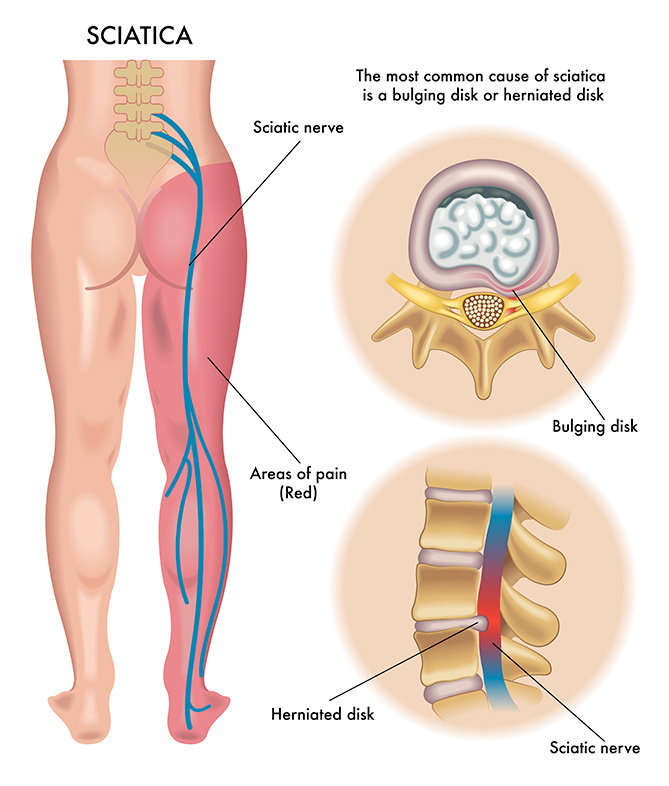 Sciatica is a common term for any pain resulting from irritation of the sciatic nerve. The pain usually starts from the lower back or buttock and extends to one leg or both legs. The patient’s pain level may escalate from mild to moderate and severe, and could lead to one’s immobility. The University of Maryland Medical Center estimates that just over 40% of Americans will experience this kind of pain in their lifetime. It’s common because the sciatic nerve is the longest nerve in the body; therefore, pressure can be placed on it at many locations. Simple home care remedies can be applied to individuals who are only experiencing mild pain or discomfort. Cold application is done to lessen any sign of swelling and relieve the pain on the affected area. Lifestyle modification is advised to patients living a sedentary life by including in their daily activities exercises focused to strengthen the lower back muscles and reduce symptoms of pain. Spinal Manipulation – a non-invasive procedure that is proven to be effective and safe in treating sciatica. It treats the misalignment of the spine as well as other signs causing swelling, muscle spasms, and pain. Spinal Decompression Therapy – gently stretches the spine, relieving pressure from the discs, joints and muscular tissues, while enhancing the body’s natural healing process. Ultrasound – use sound waves to treat the underneath tissues and relieve the patient’s pain, swelling or muscle spasms). Interferential Electro-Therapy – used for pain relief and to aid in reducing the swelling of soft tissues. Cryotherapy – reduces inflammation and helps to control sciatic pain. If you are considering surgery, Dr. Kaster can perform EMG and NCV tests to determine if there is any permanent nerve damage secondary long-term sciatica. Chronic sciatica can affect almost anyone. If left untreated, it may result to further damage. The worst scenario is loss of bowel or bladder movement, paralysis, or inability to live a normal life that is free from pain or discomfort. If any of the symptoms above are greatly affecting you and preventing you from doing the things you love, seek immediate medical advice to confirm the real cause of your sciatica problem and get the appropriate treatment. Chiropractic is safe, effective, and the only key needed to restore your spine’s normal function and mobility. Live the kind of lifestyle that you wish, free from worries or pain. Schedule your chiropractic appointment today.